Discussion: Levels & Ranks. Posted by Master Chronicler. At one point I was struggling with names as I don't think any god would like to admit to calling itself a "Lesser power" but the terms are familiar to RPG'ers already which is why I left it that way. However I have all sorts of possible alternative names for levels. In addition perhaps certain Divine Ranks might have a named title in addition to rank. The Theogenesis game here on RPOL offered dozens more I won't list them here because there could be all sorts of different names the gods and powers attribute to themselves. Different attempts have been made to define the divine ranks and what they might offer. I provide here two examples to give us a starting point of ideas we can discuss. This is from the Immortals Handbook the Quintessence column is an example of ridiculous numbers I would rather not keep track of. I don't want a list of how many followers you have either because it shifts sometimes its up sometimes its down and in the long run exact number for that kind of thing is irrelevant in this game. In 3.5 a demigod had 1-5 divine ranks I would like to see Divine Ranks be a measure of how many Challenges a character has completed also as Gothenem said when you are in your own home plane you should have a higher divine rank than when you are on say the material plane also your avatar will not have the same divine ranks as you. The divine ranks (and benefits from them) fluctuate but the Levels do not they are constant. This is quite interesting. I find everything above the Immortals a bit strange. Presumably the Titans were Sidereals. Odd term. I do like the breakdown of Domains and Portfolios. The Quintessence numbers are absurd. You could represent that with just a linear progression with each higher level just being hard to achieve. I'm not sure Divine Rank equaling your Challenges is workable. With 10 categories and 18 ranks, one additional challenge would get you another rank. Just how many Challenges would you need to become a Time Lord, for instance? On that table, you'd need 200. Nobody would play the game long enough to ever get there. I don't agree with their divine ranks being placed where they are anyway yes 200 would be absurd I am not saying I would use each of the levels and ranks as they are presented in the chart just sharing though to get some good ideas and work out our own table. We need to agree then on how many ranks there are to begin. Then levels. I think once we have those we can proceed from there fairly rapidly. Deities are really not the only divine beings, and one of the things that I felt D&D did wrong was not have a system that allowed for other divine beings other than actual deities. For example, demon and devil lords, celestial paragons, Primus, Lady of Pain. To look at other mythologies, things like Fenris Wolf, Níðhöggr (the dragon gnawing at the roots of Yggdrasil), archangels, elder gods (cthulhu), Titans, etc. I think a "divinity" system should also include these "not actually gods but still divine beings". So, I think a 1-30 system for deities (it is possible to go higher, but generally not for players). I dislike the term Godling, as it implies "Gods" are the only divine beings, and I dislike that idea. Also, I think Primordial should be a category of divine being, rather than a level of power. Thus a being could be a Primordial instead of a God, and it could be a Divine Rank 13 Primordial, making it a Lesser Primordial, where a divine rank 13 deity would be a Lesser God, a divine rank 13 angel would be a Lesser Celestial, and a divine rank 13 duke of Hell would be a Lesser Archfiend. I am not sure about 5e, but 4e Forgotten Realms had the idea of Primordials being a separate group from gods - just as powerful, but without the need for 'worshipers'. Some beings are not actual "Gods" but should still be on this scale for power. This includes Archangels, Dukes of Hell, Fairy Royalty (Titania and Oberon), Elder Evils (CTHULHU), Titans (Cronos, Uranus, Gaia), Asgardian giants (ones like Surtr, Thrym, or Ymir), and other divine-strength mythological creatures (Fenris Wolf, et. all). 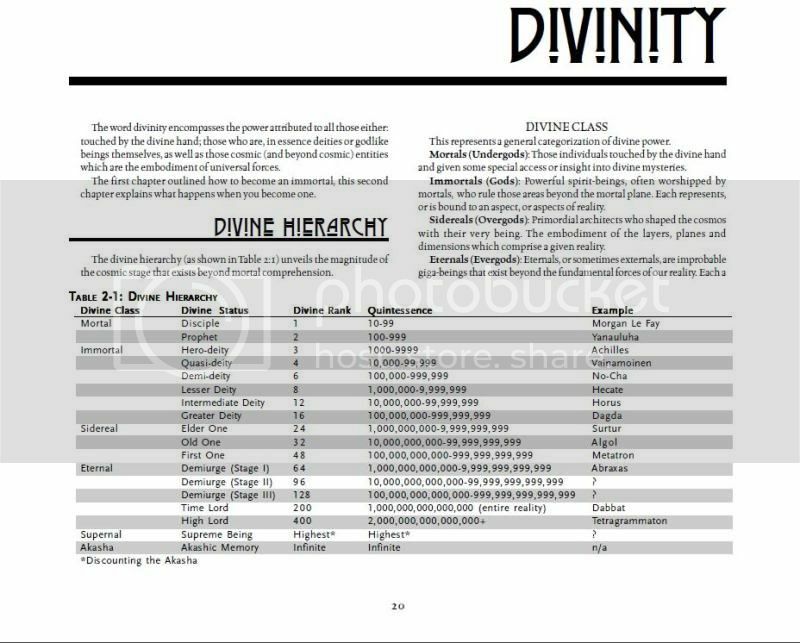 Also, despite the fact that they all use the "divine rank" system, the actual abilites of different divinities should be different. Thus, a Devil would have different abilities to pick from than a god, and both would be different than an archangels list. There would be some overlapping abilities, but, they would effectively be different "templates" that all used the same divine ranks mechanic. Also, I like the idea of Vestiges being dead or lost beings. It especially meshes well with the idea of the Binder class from the 3.5 Tome of Magic - which is a really cool concept. See Game Design Thread for my Ideas on Avatars. In addition, I like the idea that deities divine rank is not "set in stone" As they use divine power, it could drop. In places of power (such as their home plane, or in a location that is part of a pantheon's power, such as a greek god on Mount Olympus, or a Norse god in Asgard) their divine rank may be higher. Consequently, in some places, their divine rank could be lower, or even gone altogether (such as on the Material Plane - which is why gods tend not to go there). I liked the idea that in a Forgotten Realms novel, Finder Wyvernspur (a demigod) needed to go to Sigil, where deities cannot enter. So he put all his divine power into an artifact and was able to enter. Of course then the artifact got stolen, and Finder was freaking out to try to get his power back. There are several examples of this in actual mythologies as well (though none come to my lack-of-sleep brain right at the moment). You could also increase divine rank by sharing with another deity or group of deities, making pacts, agreements, etc. or other methods. Meh. Angels and Devils, even arch versions, are not gods or even on part with them. Let us use Micheal as an example or even better yet Lucifer. These are both beings of relatively equal strength. Every single time an angel goes bad in any type of story the God of the universe cast him or her to the pits. Every time. There is no divine struggle. There is no I don't want to. It just happens. The Book of Exalted Deeds and Vile Darkness both address the concept rather well I felt. High level angels and Devils can acquire followers and gain an actual spark of godhood, but that is what they become. Take Orcus as an example. Although technically he might qualify for Vestige Status these days he was once a demi power if not a lesser power. As for Elder Evils and the like it would be handled on a case by case basis as opposed to a this is what it is. Kezef is not a unkillable thing. He is similar to the Tarresque. Dies and gets reformed. I terribly dislike the idea of Primordials as that is a further set of rules that we need to create that has no basis on the scale we are trying to build which is for gods. I personally don't want just deities to be the only beings at that power level. It makes for a fairly dull experience. While most Archangels and Archfiends will have divine ranks, the vast majority will still be at the lower end of the spectrum (with 0-5 divine ranks), only the most powerful of them (Michael, Lucifer, etc.) would be higher, and even they would rarely have more than 10 Divine Ranks. And for a being like God (for 3.5 rules, we could assume a divine rank of 19 or 20), banishing another from God's own realm, even a divine rank 10 opponent, should not be overly difficult - it's not like God actually destroyed them, only banished them - and Corellon Larethian (Divine Rank 19) did the same to Aureshnee/Lolth (Divine rank 15), so there is ample example from actual source material to suggest it would not be difficult for another being of similar or greater power to do so. Note that I did say Fenris Wolf, not Kezef. While Kezef is based on Fenris Wolf, (including the biting of Tyr's hand and all that), we have in the past in this game pointed out that they are separate beings, and that Kezef is a 'poor man's Fenris Wolf'. I can't remember the particular forums (I think it might have been dicefreaks), they had a system of "divine ranks" for beings like archdevils, et. all called Virtual Divine Ranks. Of course, one of the problems with the divine rank system was the entire "most of what you can do won't affect beings of higher power than you". Something I would like to drop or at the very least alter in some way. Otherwise it takes away a lot of the challenge (no, not all, but it has been problematic for both players and GM's in the past). But giving "divine ranks" to these other beings can also serve other goals. I do like the idea of Primordials, though not exactly the way that they were presented in the 4.0 books. In a way, you could consider the Titans of greek mythology as primordials, where the gods were actual deities - the Titans were not. They did not need or even want worship. A similar argument could be made for the frost giants and fire giants of Norse Mythology, though to be fair, Norse mythology was fairly underpowered in their actual stories compared to say the Greek/Roman gods or the Vedic (I hope I got that name right) gods. Elder Evils (and by extension, things like Alien Intelligences from Palladium books) WOULD be done on a case-by-case basis, but what I am proposing is that "divine ranks" do not have as big an impact on some types of beings as they do others. Consider the "Deity Template" as given in the 3.5 rules. It says things like: Max HP per Hit Die, add Divine Rank to attacks, skills, saves, blah, blah, Immumites to a whole bunch of stuff unless it comes from Divine Rank = to yours or higher, SDA's equal to Divine rank + X for being a whatever level power, etc. How much of that is "Divine Rank" and how much is "Being a God?" What do the divine ranks, if separated from "Being a God" actually represent? This is one of the issues we came across last time, and we sort of fudged our way through it. That said, I don't want Archangels to just be "Lesser Gods" or "Demigods" I don't want Elder Evils to have a base set of powers so that you know exactly what you are going to get each time you encounter a different one. In fact, few (if any) of the salient divine abilities would be something I think they should even be able to have (ie. I don't think Cthulhu should even have the option to have Avatars, and I don't think that Archangels should have the ability to Alter Reality), but they should (and do) have a divine spark within them that should not be discounted. So I am thinking that having Salient Divine Abilities would be a "God" thing, not a Divine Rank thing. In fact, I don't want to have number of Salient Divine Abilities to be tied to Divine Rank at all, and would prefer if it was attached to a different system, like Storyteller's idea of Trials. I would rather Divine Ranks have an impact on things like Dice Rolls, possibly some immunities (though not the same way 3.5 did it), and stuff like that, and some abilities could be tied to divine ranks (like if you have 10+ divine ranks you get this bonus to this ability), but for Divine Rank (especially if it is a more fluid number), to tie into every ability of a deity seems a bit too clunky. Even an "Archfiend" template could have something like: Archfiends have a divine rank. Archfiends add their divine rank to XXXX if they are in their place of power. Outside their place of power, archfiends do not get this bonus. Archfiends can exert some control over their domain, and can manipulate their home in the same manner a deity of equal divine rank. They do not gain any immunities from their divine ranks, nor do they get Salient Divine Abilities. Archfiends do not need worshipers to survive, but gaining worshipers also does not grant them extra divine ranks. Archfiends cannot have avatars, but can create aspects. Creating an aspect weakens the archfiend, and while the aspect exists, the archfiend looses two divine ranks (for a greater aspect) or one divine rank (for a lesser aspect). When an aspect is killed, or when the archfiend decides to re-intigrate it, he gains the divine power back. Aspects are not under the control of the archfiend, and can act autonomously, and may even try to work against the deity that made it. Archfiends do not have a Portfolio or Sphere of Influence, and cannot sense anything beyond what their normal abilities allow. Another thing I wanted to do was actually separate the ability to grant spells from the deity. Divine Spellcasting should be more an aspect of the character's faith, than the deity. Disappointing a deity or a deity dying can still impact the character's ability to receive spells through that follower's straying from their path, or the doubt that comes from believing your deity perished than any conscious decision of the deity. A deity could also send a worshiper a dream or feeling that he has strayed, and that doubt from the deity's message could be enough to affect their ability to call upon divine spellcasting or other abilities. Such is the fickle power of faith. Because of this, a character could worship Cthulhu or Michael or Demogorgon or Batman or that girl who lives down the street, and receive spells through their faith alone. Also - by separating that, it prevents the whole "You have to buy additional domains with SDA's", and makes it so it's more of a "If a domain fits the deity, go ahead and take it." I am brainstorming a few ideas, and they are starting to take an interesting shape. It will take me a bit to put them down, and collect them cohesively, but I will give a writeup and comparison to some if the ideas already out there when I can do so. I am hoping that I will have extra time over the holidays to do so. It's sounding too much like semantics to me. Whether you call an entity a god, deity, angel, demon, geek or rubber baby buggy bumper, we're talking about an entity with 'divine-level' power. I thought we were using the term 'god' (or deity) to refer to all of them, regardless of the actual power or label. Perhaps we should just all them 'Entities'? Or Higher Beings? As for the demons and such, maybe it gets down to where they get their power from? If we say that there's this 'divine' power, then only the Entities that use of have it are 'gods'. Demons, for instance, might be Planar Powers in that they get their power from their home plane. Rather than the Entity affecting the plane, perhaps its the nature of the plane itself that affects/corrupts the Entity. That's not so say that the Entity didn't start out with an inclination that way. Who else would dip into a cesspool of evil? As for levels and challenges, it's about the range. To go from last tier to first tier, how many steps do we want there to be? If you are playing the game, how long is it going to take to work your way up to the first tier? In my own experiences around the gaming table, I never played/DMed a game that took characters up to 20th level. The highest we ever got was around 15th. By then, players were bored with their characters. They had more fun when the characters were low level, so we started new characters. For the number of challenges, do we want it to be strictly linear, or progressive? Ascending or descending? Linear--3 challenges per level. If there are 10 levels, then a total of 30 challenges to reach 1st tier. Ascending Progressive--takes 2 challenges to gain the last tier, 3 challenges to get to the next tier, etc. This means that the higher you go, the harder it is to get to the next tier. This would be something like 60 challenges to reach the top. Descending Progressive--takes 6 challenges to gain the last tier, 5 to get the next tier, 4 for the next, etc. This means its harder to begin with, but gets easier the higher you go. Another option is a sort of bell curve... easier at bottom and top, hard in the middle. Or hard at the bottom and top, but easier in the middle. There is always the possibility of an Entity having more than one path option. When he starts his divine climb, he chooses one of the above 5 paths. Or the path could be associated with the type of deity he's striving for: god, primordial, eternal, old one, etc. it'll still have that baggage associated with it. Same thing for 'challenges'. Can't really think of a better term, but I'm just not crazy about calling them challenges. I was thinking of 'quests', since mortals are often sent on quests to prove their worthiness to ascend. Possibly 'callings', as you have a higher calling. Anyway, I'm thinking 30 quests is probably a reasonable number. The flipside of that coin, though, is that the higher quests would be more difficult. Regarding Salient Abilities... I think I'd like to see a core set for each category of Entity that requires no power expenditure. By becoming that level, you've acquired those powers. After that, you can choose what new power you gain at each level. Then there are powers that you have access to, such as Alter Reality. Is it automatic? Should it be? I'm thinking NO on both counts. There could easily be a Minor and Major version. Minor lets you do things with just your normal power. Major means you have to temporarily reduce your Divine Level. Speaking of which, should there be a condition under which the Entity regains his Divine Level? In the case of demons and such, returning to their home plane seems like a reasonable condition. Others might be bathe in the heart of a sun, spend time under the stars (specific stars? ), visit Yggdrasil, etc. I'm thinking nearly all reductions would be a temporary thing. You still have the same skill set and level of learning, followers and priests, and what have you so under normal sets of relative circumstances you should recover. Think of it as divine fatigue. As for the semantics of Angel, demon, and what have you it very well may be semantics, but in this instance it might be warranted. Do we need to go about making thirty types of tables when one concensus might be difficult? Let us start at the one set and if we find that it is to restrictive we can always add an ability set to that with a more detailed area. Challenges, quests, callings. It matters not for the mechanics. We could call them hot air balloons made of frozen roses and it doesn't change the fact they are what they are. OK lots to respond to here so I'll try my best if you feel I haven't addressed something let me know. If you feel we need to create another thread for another discussion element let me know. When I posted for help in the Game Proposal thread I labeled it "God Game" because it was a simple enough way to get my idea across but make no mistake I see the game to encompass more than just "Gods". This is why often I like to use the word "Powers" or better yet Immortal because often God is a term used for a being who has a relationship with mortals where they are worshiped. There are those who worship demons, devils, angels even Primordials look at the Warlock class in 5e but this is only the D&D view. In real world mythology many angels, demons and faeries were gods that were demoted to a "lesser" status. Again it comes down to semantics I am reminded of a quote from Hellraiser "Angels to some, demons to others" it matters not just that there are a hierarchy of immortal powers that should include other concepts outside of D&D like Cosmic entities that appear in Marvel & DC comics. As such I would rather handle each on a case by case basis instead of making basic assumptions that all "angels" should have such and such or all arch devils should be the same. OK I agree that Godling might not be the best name I got it from Primal Order but I don't like Quasi power either. I also can agree that Primordial is more a type not a level (But not sold on the name Paragon) We'll have to brainstorm more name ideas. BTW Yes Gothenem it was Dicefreaks that had the Virtual Divine Ranks for the arch devils. Also Salient Divine Abilities or Powers are called "Gifts" as of right now. Also yes Starmaster I am open to calling Challenges Quests. If the terminology is confusing I can always update the Lexicon that's what it is there for. I guess my assumption was that the purpose of these assorted games was that you wanted to play a god. Therefore, everything in the mechanics of the game was built around that. The same thing applies to 'divine'... By using the word divine, you automatically think god. So you now want to say that they don't mean the same thing. While I'm not sold on the term 'entity' yet (even though I suggested it), I'm going to use it to avoid confusion. My may have to coin a new word to mean what we want. So, I like the idea of having different types of Entities: gods, angels, demons, primordials, etc. Each of these types should have their own special powers. Maybe even their core power comes from a different source. Gods would, therefore, have Divine Power but demons wouldn't. This then serves as the basis for making the distinction between the different types. Ranks and Power Levels are more-or-less the same thing. Each Rank might encompass 3 Power Levels, but you wouldn't have a 3rd Rank with 20 Power Levels. I think that would just complicate things unnecessarily. Ok first we need to realize this is a bunch of people trying to hopefully hammer a workable system out of nothing. We are ad hoc modding the heck out of several systems. Which leads to some confusion for all of us. We need to start simple and then add the various components on after the fact. Which is why I keep going back to let us start with just gods. It seems that Elder Evils we all agree should be completely unique. So they don't even make the chart system. Gods first and then we can add in various aspects of semantics. Angels, demons, or rubber baby buggy bumpers. It doesn't matter once we have a base. As for the matter of divine spellcasting go reread the section in the PHB about spellcasting. You can be a complete narcissistic button head and receive spells because you think you are totally effing awesome. If you are a worshipper of a God however it should be tied to that god or why do Gods even exist? Which is a whole other discussion. Yes, I think most challenge/quests should essentially be boiled down you increasing your legend and therefore increasing your followers. Even in the MU gods and 'deities' take their power from followers so hammering out what divinity means should be a prime goal at this point so we can build from that. I think we should start with the idea that Spirits(from life or not) is the base rank. Theogenesis failed at this aspect, but also seemed to at least try to incorporate it into the system, which is to say they didn't hit the mark well. They started with the idea that each character was once a living person, who died and by chance inherited divine power, giving everyone a common start and the ability to become a full fledged deity. I don't much love that part but at least they tried to start simple and go from there. Well, I was just getting at that if the initial framework is done properly, everything else should fit in easily. Otherwise, you risk having to shoehorn something in, and that almost never works. So we're back to defining Ranks and Levels. If we're talking multiple Challenges/Quests per level, then we may not want to have that many levels. I'm thinking that we might want to have a core area, such as Exarch, Lesser, Intermediate and Greater (or whatever terminology we decide on). Group them like Hero Levels (can't remember what they are), so the Champion-equivalents would be below that, the Epic-equivalents would be this group, and then the other group would be higher than that. That way, we only have to deal with the middle group at this point: the Exarch, Lesser, Intermediate and Greater deities. I'm inclined to put the Exarch at the bottom of the list. I like that setup. It's universal enough that it could fit any alignment and provides our framework. Levels could actually be more like titles and unique names, the one I can think of off the top of my head is Satan but he's also got Lucifer, Prince of Lies, ect. More obscure ones include Lord of the Morning, the Shining One, Lord of Light. Yes, in the game, the players are playing gods, or deities, or what-have-you. That doesn't mean there aren't other "divine" beings out there. Just like in most campaigns, players are limited to certain "races" or species they can play, but there are others out there. Also, I dislike the idea that "worshipers" grant power. Lets use real world Christianity as an example (I know, touchy subject, but it highlights the example well). That is not to say that his divine power would be as high as God's would be, but that fear would be enough to give him some power. This would work well for deities of fear, death, torture, disease, famine, and things like that. Much of their power would come from fear of what they bring, rather than worship of it. I really don't want to put actual numbers on that either. I don't like the idea of tracking number of worshipers - it seems like a needless amount of record-keeping. As for challenges/quests - I prefer an ascending progression. The higher up you get, the harder it is - and in addition, the quests themselves become harder. Something that would gain you power as a demigod would be only a drop in the bucket for a greater power. Much like how an extra $100.00 cheque would be a huge benefit to a person living paycheck to paycheck, but to someone like Bill Gates, it is barely noticed - a drop in the bucket as it were. On the matter of divine spellcasting - deities exist to deal with certain aspects of existence - Helios drives the Sun across the sky, Hades punishes the bad people after they die, etc. Most of these deities have "jobs" they do, to maintain existence - so that is why they are needed. Divine spellcasting is not the reason to have gods. In the PHB, you can believe in a certain idea or concept, NOT a deity, and still receive spells - so how does that work? The complete narcissistic buttonhead who worships the concept of nature can get spells, even if he eff's up, but the one who worships Gaea can't? That seems a bit unfair. Now on the mortal level, the particular semantics don't really matter, but when you are playing on the other side of that equation, they do - one of the reasons it should be addressed. I like the idea of a certain set of powers, but instead of doling out a new power every level/rank, I think each category (demi, exarch, lesser, greater, what-have-you) should have a basic set of powers, ones that Scale up with actual rank. These are in addition to the ones that are selected by the player (or GM in the case of NPC's). By extention, other "divine" beings may have a different set of abilities, that may or may not scale up by "rank" as well. For example, a deity could have a power like "Alter Reality" but it scales, so a demipower has limited ability to what he can do. At rank 1 it's weak, but by the time a deity reaches rank 20, it is incredibly potent. That said, I also like the idea of Minor and Major, something like "You can use this power to do X. If you wish to sacrifice divine power, you can do Y, but loose Z number of ranks." In 3.5 both Forgotten Realms and Ebberon used the whole you placate and worship me just by saying that you don't want me on your doorstep kind of thing. As in Auril gets prayed to just before a voyage leaves Watership so that the ship will encounter no storms. Counts as worship. That should count as worship. And no I have no idea how to reward that in the total of worshippers for divine rank. Unless we did an inverse of the actual worshippers. Very few will worship murder for example. A good number might worship the Ice Queen. That's why I was proposing a legend system, where is not necessarily whose uttering your name, it's how many know about your exploits. Atlanta fought for the golden apple in the first Olympics, Atlas held the world up, Hercules had his twelve labors, ect. It's what you do that really matters, and it matters how epic it is too. As for Worshippers, and in the case of the devil, he doesn't necessarily have to have followers or worshippers... he leads people into temptation. Anyone who goes gives him power. Some thing for murder. You don't have to worship murder, but if you commit murder, you are granting a little bit of power to that deity. I was thinking it'd be like God got the 'good stuff'--worshippers, and the Devil had to make do with what was left, eking out a power base by claw and horn, etc. As for keeping track of worshippers, no, doing it by actual numbers (1,000 or 1 million, etc.) makes no sense. I was thinking it, too, would be a rank. At Rank 1, it gives you one Power Point, etc. It would be one of those areas where you could attack another Entity by stealing/converting some of his worshippers. Power Ranks below 3 can be used to cover angels, saints, whatever. Power Ranks above 7 can cover the Primordials (or whatever). Yes Immortals can gain power from worship but it can come in many forms. Santa Claus for example is not worshiped but is driven by belief collected from the children of the world. For Demons & Devils it may be more that they are feeding on fear than adoration but it is the same basic concept. No I do not think its necessary to keep track of how many followers only a sense of how much influence one has on a world. I will get into detail of what I have in mind on each power source in the near future. I am ok with challenges/quests being ascending progression. Gothenem "I like the idea of a certain set of powers, but instead of doling out a new power every level/rank, I think each category (demi, exarch, lesser, greater, what-have-you) should have a basic set of powers, ones that Scale up with actual rank. These are in addition to the ones that are selected by the player (or GM in the case of NPC's). By extension, other "divine" beings may have a different set of abilities, that may or may not scale up by "rank" as well." Again each Challenge/Quest could be gaining a sphere, entering into a contract, finding an artifact, building your Home Plane etc. There should be a minimum of challenges needed to be completed before one can advance to the next Level. Completing a Great Challenge/Quest should be something a bit different that allows one to move up a Level. If that is too many Levels we could take out "Lesser" originally I had just only 7 Levels in mind and I also want a rank 0 for a Vestige (Dead power) which has no avatars no home plane limited to what it can do although it may have followers and always has the chance that it may be resurrected. I like it. How do you envision pantheons working out? Any special provisions for teams of gods or families? Exhaustion: Immortals don't need to sleep or rest. Humanoid immortals occasionally sleep only because they are accustomed to it, not because they need it. This allows immortals to get more things accomplished. Starvation and Suffocation: Immortals do not need to refuel their physical bodies. This is another detail that some young immortals continue to take care of-not because they need to, just because eating is something they enjoy immortals are also not reliant on gases, water, chemicals, or any other substance to keep a body running. Human immortals could survive underwater, for example; they do not have to breathe. Toxins: Because the primal energy running through immortals' bodies instantly destroys any toxic material, immortals are immune to the toxic effects of poisons, gases, and other substances. They are also immune to mortal diseases and viruses of all kinds. Environment: Immortals bodies are immune to the full spectrum of environments that are native to the plane from which their body originated. This may differ from immortal to immortal. Human immortals could survive under conditions from the Arctic's harshest winters to the desert's hottest sun, but they could not survive on the sun itself. If a immortal were to inhabit the body of a creature who did live on a sun, then the immortal could survive there, although in this body, the immortal would not be able to survive on earth, which would be extremely cold by comparison. An Immortal may have additional immunities bestowed upon him through connection with his Sphere of Influence, granted by Pantheon, or achieved through Apotheosis. The mere presence of a immortal can deeply affect mortals who might find the experience either uplifting or unsettling, depending on the immortal’s mood and their relationship to the immortal. Immortals are immune to the auras of immortals of equal or lower rank. The immortal can make its own worshipers, or additional allies immune to the effect. The immunity lasts until the immortal dismisses it. Once affected by an aura power, creatures remain affected as long as they remain within the aura’s radius. Daze: Affected beings just stare at the immortal in fascination. They can defend themselves normally but can take no actions. Fright: Affected beings become shaken and suffer a –2 morale penalty on attack rolls, saves, and checks. The merest glance or gesture from the immortal makes them frightened, and they flee as quickly as they can, although they can choose the path of their flight. Resolve: The immortal’s allies receive a +2 morale bonus on attack rolls, saves, and checks. In addition the immortal should choose a description appropriate to the character of what aura appears like. This is known as the immortal's Nimbus and could be visual (crackling green energy), auditory (rustling papers) or a smell (smell of a bonfire). An immortal can understand, speak, and read any mortal language, including nonverbal languages. Remote Communication: The immortal can also send a communication to a remote location. mile per rank away from a site dedicated to the immortal (such as a temple, shrine, or sacred grove), or within one mile per rank away from a statue or other likeness of the immortal. The creature being contacted can receive a telepathic message that only it can hear. Alternatively, the immortal’s voice can seem to issue from the air, the ground, or from some object of the immortal’s choosing (but not an object or locale dedicated to another immortal of equal or higher rank than the immortal who is speaking). In the latter case, anyone within earshot of the sound can hear it. The immortal can send a manifestation or omen instead of a spoken or telepathic message. The exact nature of this communication varies with the immortal, but it usually is some visible phenomenon such as a beam of light, a change in the weather, a gathering of animals, or almost anything else. A immortal’s communication power can cross planes and penetrate mortal barriers. character is able to cast spells using the deity as a conduit. The exact terms and details of how this is accomplished vary from world to world, setting to setting. Change or apply a gravity/energy/time trait etc within their realm. Here I pulled this off the wiki. Just as a basis off what can be classified by devasites. Most dieties would be classified as copper/rainbow state. Primals could be almost silver, but they are still singular in nature and once the kindgom dies they go to. We the devasites view Immortality as only a point of view. There are many levels of ascension, coding of the kingdoms here in the 42, and those outside the 42. As you grow young deva, you will be challenged to survive and grow into the net phase. Below is the basic 7 states of existence by connection, of the universal 42. But not always will be the case. Below is the colour, rank, and word use to describe the codes. Alpha(White/Clear)-Base codes of all existence think of it as bits or the the 1's,0's, and -1 to all existence. From this all existence is made from the omega and the alpha in a dance always changing positions, we do not know what exists here only supreme level entities know. But those of us who learn code know how to make and change things around us. ( Example the movie nothing the white place) Life and death does not exist here, so no death or transition. Supernatural/Singlegery(Copper)- These are the singular existences also known as planes, bubbles, or singular places. They only exist as one state and very little transition occurs unless outside forces occur They always exhibit the same traits and never change. They only exist for one age at a time always connected to rainbow state. Life forms or programs generated by these states live a singular existence. Once derezed all code is lost most of the time, and cannot be restored. Immortality is limited as long as the kingdom its attached to is living until it dies or is destroyed by natural or aritificial means. (Examples are hell, heaven, planes, attached to a kingdom) Life here is singular, once death comes, all states revert to alpha or ultra depending on the transitional period, stage in the age(Late period). Death here is oblivion. Rainbow state/Energy(Rainbow)- This state is based upon element of or rule of 3 (friction/motion/time). Another is (moment/transition/expansion). There is always flux going on, paradoxes caused thru interaction, and life is the most abundant. Death is always a guarantee but death behaves more as a transitional force where as in the copper state once it is taken it is gone into ultra state. ( examples of this are prime material planes and their parallel time streams, or the multiverse known to hold clusters of kingdoms). At this stage death is only a transitional force, immortality is enhanced only by singular state or connections to such places. Hypernatural(Silver)- This is known as the void or the barrier state that keeps the states of existence apart. It prevents beings from one moving to the next, multiverses, and kingdoms from ripping each other apart, and cleaning up the garbage those states produce. This state also changes codes all the time so those travelling from one kingdom to another does not cause a causaulity collapse, or a paradox. Immortality is found only in the programs that exist here to provide balance and self repair. Most devasites fall into this category but are in silver state in rainbow state. Death only occurs in the form of loss of memory and personality. However the body and base codes never changes. Supreme Natural(Platinum)- This is an alien state of ascention beyond what we understand traditionally. This is where the highest level of being exists. It is beyond what most beings know. The only supreme enities known are the Supreme Westway, Nature, and So called Ascended god of all creation.